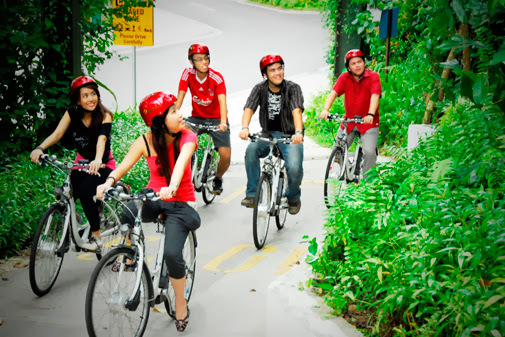 A true island adventure awaits with the Gogreen Cycle & Island Explorer at Sentosa, Singapore’s island resort. Journey through beautiful tropical greenery on Eco-friendly Gogreen Hybrid bicycles, letting you experience how island life was in the past. Join the Sentosa Island Explorer and uncover hidden gems scattered around the island. Explore areas like the Coastal Trail near Fort Siloso, where the Dragon’s Teeth Gate once stood; the massive mounting of the 9.2" breech loading gun at the top of Imbiah Lookout and many more fascinating spots. Besides the Gogreen Hybrid bicycle, there is also a range of regular bicycles to suit different preferences. Even young children who are inexperienced in riding can rent Rosie bicycles for an easy pedal. Head down to the Gogreen Cycle & Island Explorer with the whole family for a fun ride through nature today. 5 Places in Seminyak that You must Visit !! Copyright © 2012-2016 TOSCA HOLIDAY All Rights Reserved.